Glycerol is mainly generated from biodiesel, thereby making it a renewable and clean-burning fuel which can be used for industrial purposes. It is a key ingredient in production resins and gums which are used to make modern protective coatings including exterior house paints and automotive enamels, thus driving glycerol market demand. Glycerol products are widely used in personal care products owing to its property of acting as humectants and solvents. Personal care products market is likely to surpass USD 650 billion by 2024. It acts as an effective moisturizer in cosmetic products and makes skin absorb water from air reducing dry and dull patches. Humectants help in retaining water in the skin which minimizes water loss due to evaporation and maintains water balance on an intercellular level, keeps skin well hydrated and nourished. These factors are likely to stimulate glycerol market growth by 2024. Glycerol was formulized as an anti-freeze agent for automotive applications before it was replaced with ethylene glycol due to a lower freezing point. The least freezing point of the product when mixed with water is high as compared to ethylene glycol, however it is not toxic in nature, which has led to re-examination for it to be used for automotive applications will drive product demand. The product is widely used in the motion picture industry while filming scenes which involves water to stop parts from drying out quickly. It can also be used as replacement to water in ultrasonic testing owing to its higher acoustic impedance of 2.42MRayl, along with being relatively safe, non-corrosive, non-toxic, and comparatively low cost. These factors are anticipated to fuel glycerol market size by 2024. However, the cost-competitiveness pertaining to increasing price trends in vegetable oil and fatty alcohols which are major source of the product may act as a major restraint for the market. Additionally, high raw materials costs owing to increasing demand from food and pharmaceuticals applications are likely to impact glycerol market price trends, thereby affecting industry profitability. Extensive product research has led to development of novel products with enhanced reactive properties in order to make them eco-friendly is estimated to drive the market size in anticipated timeline. Crude glycerol market size is anticipated to surpass USD 850 million by 2024. The product is added to diets of weaned pigs to enhance growth performance & nutrient digestibility and improves feedlot performance in fishing lambs. The product has application potential as an animal feed component and can be used an alternative for corn in diets, thereby stimulating product demand. More attention is being paid by product manufacturer to utilize crude form of the product from biodiesel production to decrease production cost and promote biodiesel industrialization on a hefty scale, further boosting industry growth. Glycerol industry size from biodiesel is projected to surpass USD 3.5 billion by 2024 owing to be a primary source of manufacturing due to its low-cost operations. Its purified form is obtained from biodiesel, which has numerous commercial applications usages in food, pharmaceutical and alkyd resins, thus driving market growth. Glycerol market size from fatty alcohols may show gains around 6% up to 2024 owing to its presence as a key foaming agent in body wash and shampoos formulation. Increasing application usage in personal care product segment is likely to witness higher gains in the foreseeable timeframe. Rising mindfulness towards personal hygiene and care is anticipated to further drive product demand. Glycerol market size from pharmaceutical application is projected to surpass 410 kilo tons at the end of 2024. They are used in medical & pharmaceutical preparations to provide lubrication and improve smoothness. It is also found in cough syrups, allergen immunotherapies and elixirs & expectorants. Its application as a holding agent in tablets along with its usage to preserve red blood cells prior to freezing is likely to foster market growth. Glycerol market size from personal care application may show significant gains at over 6.5% by 2024 owing to its usage in products including toothpaste, mouthwash, skin care products, shaving cream and hair care products. It is also an important constituent of glycerine soap as it prevents skin dryness due to its moisturizing properties. Beneficial FDA polices, which has placed the product on its list of GRAS is anticipated to fuel product demand in forecast timeline. 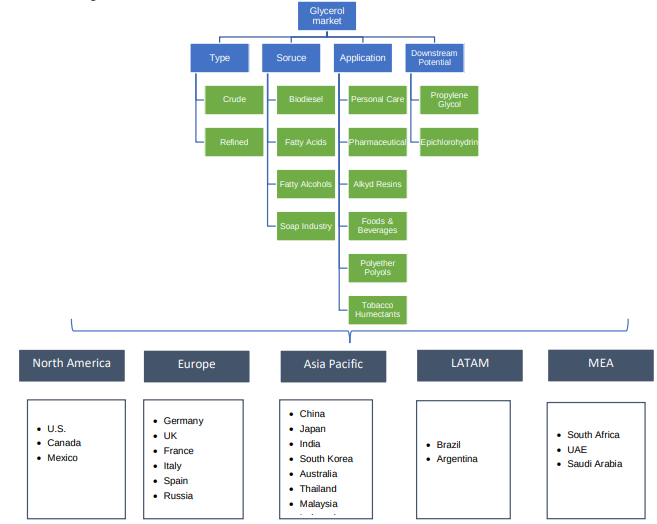 Asia Pacific led by, South Korea, Australia, Japan, India and China glycerol market size is projected to surpass USD 1.5 billion up to 2024 owing to growing application range in food, tobacco humectants and pharmaceuticals industries. The product is used with propylene glycol as a constituent in e-liquid for electronic cigarettes, which may favour regional industry growth. 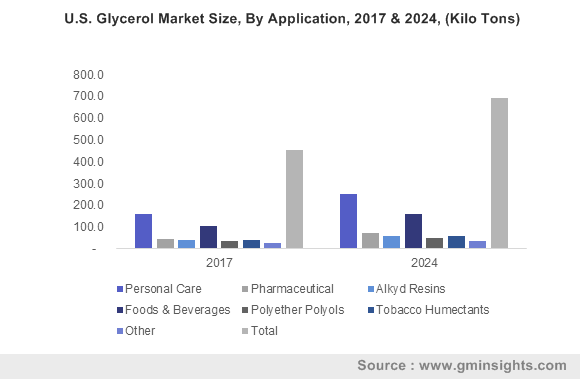 Europe driven by France, Italy, UK, and Germany glycerol market share may observe gains over 6.5% by 2024 owing to growing personal care product demand. Growing preference towards innovative and natural ingredients natural along with emergence of personalized skin care trends may favor regional industry growth. Brazil market size is anticipated to witness strong gains owing to growing pharmaceuticals industry. These products are used to treat eye disorders caused by increased interocular pressure including glaucoma. Its usage to decrease pressure in the eye before and after ocular surgery and during a medical eye examination may propel product demand by 2024. Global glycerol market share is moderately fragmented and competitive with major industry players includes BASF, Wilmar International, Procter & Gamble Chemicals, Solvay SA, Kuala Lumpur Kepong Berhad, Godrej Industries, Dow Chemical Company, ADM, The Chemical Company and Croda international. Companies are involved in merger and acquisitions activities with regional & local companies to attract new market prospects which will complement industry growth. Glycerol is a colourless, clear and sweet liquid which is an organic compound which are either in crude form or refined form. Its crude form is generated from biodiesel production is in impure form and is sold to large refineries for upgrading. It acts as an excellent source of calories for non-ruminants which includes broilers, swine and hens. The refined form of the product is colourless, and it is hygroscopic in nature, which is used applications including foods & beverages, pharmaceuticals, alkyd resins and polyether polyols.